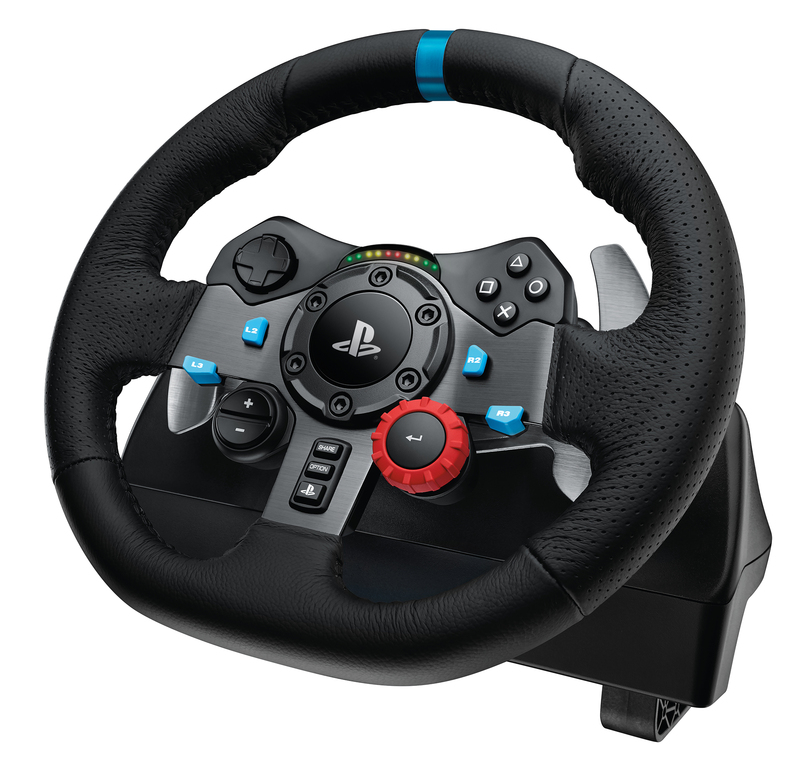 Logitech released the Logitech G29 Driving Force, a force feedback racing wheel licensed for PlayStation 4 and PlayStation 3. 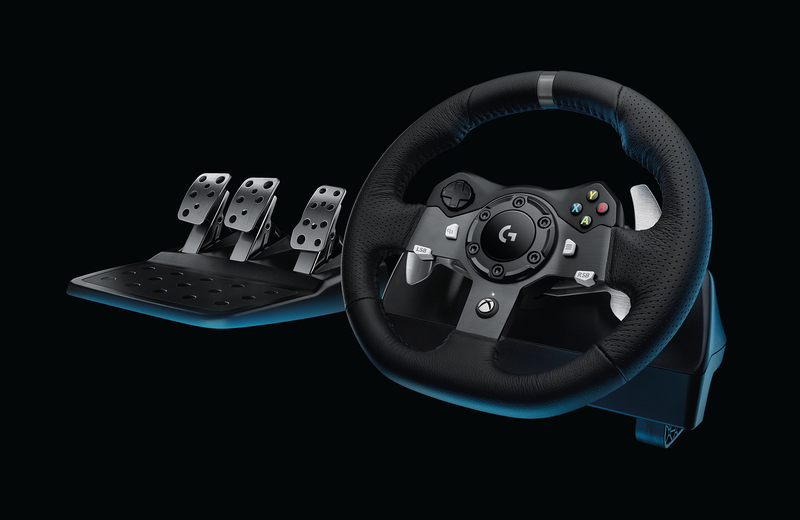 Now they also announced the Logitech G920 Driving Force, its first force feedback racing wheel available for Xbox One, as well as PC, which will be available this fall. And this are great news. You can use the G920 for TWO SYSTEMS. Both wheels features a dual-motor force feedback transmission with anti-backlash helical gearing, hand-stitched leather-wrapped rim, and stainless steel throttle, brake, and clutch pedals. The G920 is also compatible with the optional Driving Force Shifter, a six-speed manual gear stick with push-down reverse. Both wheels are “engineered with dual-motor force feedback and both simulates the feel of your car with weight shift, realistic road conditions and tire wear, so you can sense under- or over-steering, traction loss and more. With helical gears modeled after the gearing used in car transmissions, players get exceptionally smooth, quiet and precise steering action. Anti-backlash hardware also keeps the wheel and pedal input tight, to maximise control,” according to the press release. Logitech’s G29 and the G920 Driving Force features solid steel ball bearings in the wheel shaft, anodised aluminum spokes (only the G920) and stainless steel paddle shifters and pedals. We had the oppertunity to get our hands o the wheels. Both wheels have hand-stitched leather that gives the wheels the look and feel of a high-performance racecar wheel. It feels really comfortable. “Additionally, built-in clamps and bolt points allow you to securely mount the wheel to a table or racing seat to minimise shifting or wobbling during aggressive maneuvers,” according to the press release. Both wheels have a ‘D-Pad’. On this you can find the console buttons and semi-automatic paddle shifters. In addition, only the G29 has LED indicator lights that tell you exactly when to shift. The PlayStation wheel has also a 24-point selection dial and plus/minus buttons which let you also fine-tune your driving preferences. 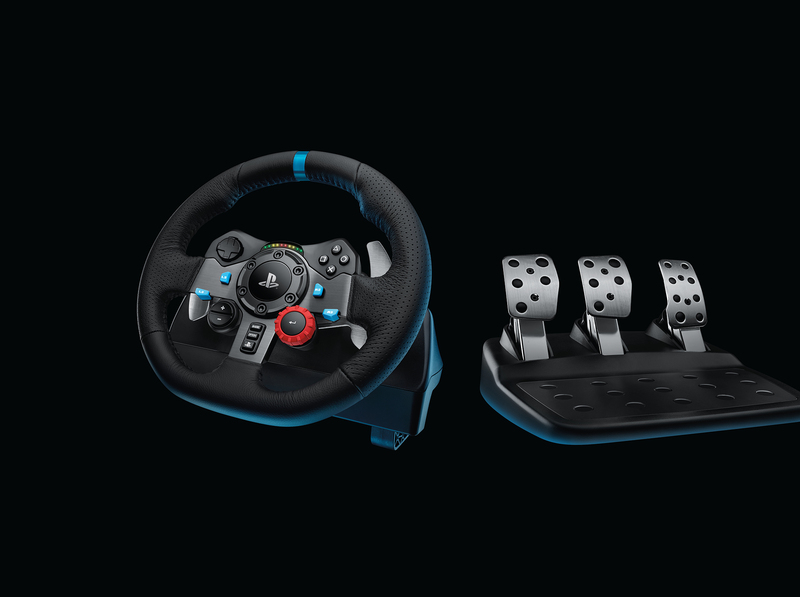 The Logitech G29 and the G920 have a separate floor pedal unit that let players comfortably brake, accelerate and change gears. We loved it how easy it was. “The nonlinear brake pedal mimics the performance of a pressure-sensitive brake system for a responsive, accurate braking feel. Additionally, both wheels includes a dedicated clutch, so gamers who want to test their abilities can have a truly immersive racing experience,” says the press release. 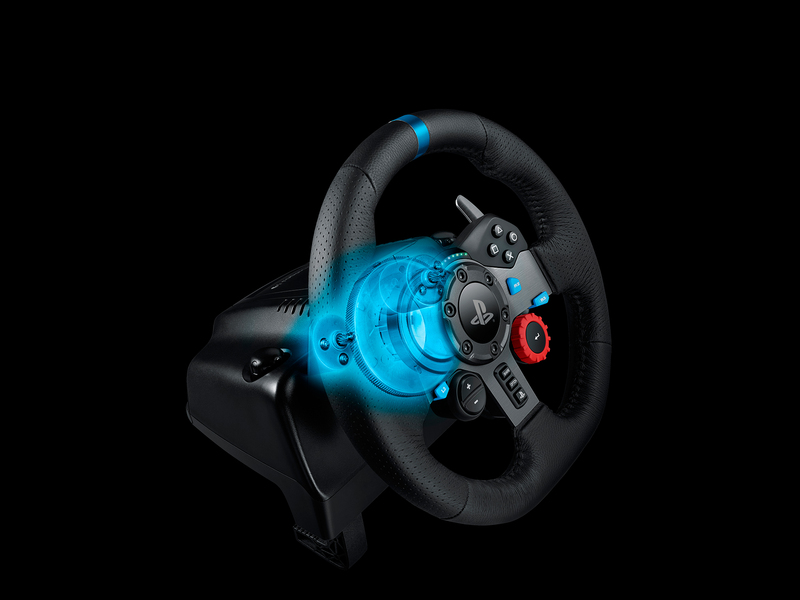 The Logitech G29 Driving Force is available since July 2015, for a retail price of €399.99. The Logitech G920 Driving Force is expected to be available in beginning in October 2015, also for a retail price of €399.99. Driving Force Shifter, a six-speed manual gear stick with push-down reverse, is also expected to be available as an optional add-on, for a suggested retail price of €59.99. 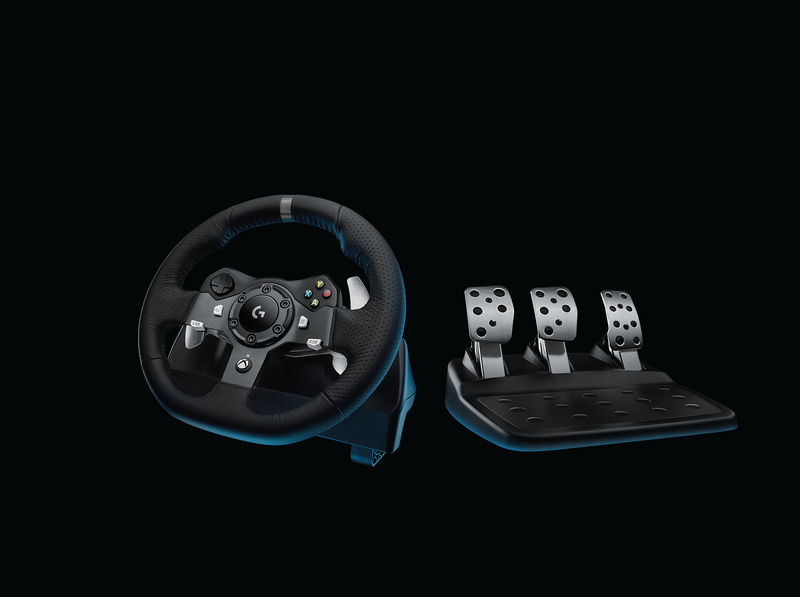 Realistic Force Feedback: Engineered with dual-motor force feedback, the Logitech G29 Driving Force realistically simulates the feel of weight shift, road conditions and tire wear, so you can sense under- or over-steering, traction loss and more. With helical gears modeled after the gearing used in car transmissions, you get exceptionally smooth, quiet and precise steering action. Anti-backlash hardware also keeps the wheel and pedal input tight, to maximise control. Durable Design: The Logitech G29 Driving Force features solid steel ball bearings in the wheel shaft, and stainless steel paddle shifters and pedals. High-quality, hand-stitched leather gives the Logitech G29 Driving Force the look and feel of a high-performance racecar wheel, and ensures a more comfortable and durable user experience. Additionally, built-in clamps and bolt points allow you to securely mount the wheel to a table or racing seat to minimise shifting or wobbling during aggressive maneuvers. Easy Access to Game Controls: For seamless access to racing controls, the D-Pad, console buttons and semi-automatic paddle shifters are conveniently located within easy reach. LED indicator lights tell you exactly when to shift, so you can maintain maximum acceleration without taking your eyes off the track. A 24-point selection dial and plus/minus buttons let you also fine-tune your driving preferences. Responsive Pedal Unit: The Logitech G29 Driving Force comes with a separate floor pedal unit that lets you comfortably brake, accelerate and change gears, just as you would in an actual car, and also allows you to maintain a more realistic body position for driving. The nonlinear brake pedal simulates the performance of a pressure-sensitive brake system for a responsive, accurate braking feel. Additionally, the G29 includes a dedicated clutch, so gamers who want to test their abilities can have a truly immersive racing experience. Realistic Force Feedback: Engineered with dual-motor force feedback, the Logitech G920 Driving Force realistically simulates the feel of weight shift, road conditions and tire wear, so you can sense under- or over-steering, traction loss and more. With helical gears modeled after the gearing used in car transmissions, you get exceptionally smooth, quiet and precise steering action. Anti-backlash hardware also keeps the wheel and pedal input tight, to maximise control. Durable Design: The Logitech G920 Driving Force features solid steel ball bearings in the wheel shaft, and stainless steel paddle shifters and pedals. High-quality, hand-stitched leather gives the Logitech G920 Driving Force the look and feel of a high-performance racecar wheel, and ensures a more comfortable and durable user experience. Additionally, built-in clamps and bolt points allow you to securely mount the wheel to a table or racing seat to minimise shifting or wobbling during aggressive maneuvers. Easy Access to Game Controls: The D-Pad, console buttons and semi-automatic paddle shifters are conveniently located on the Logitech G920 Driving Force. 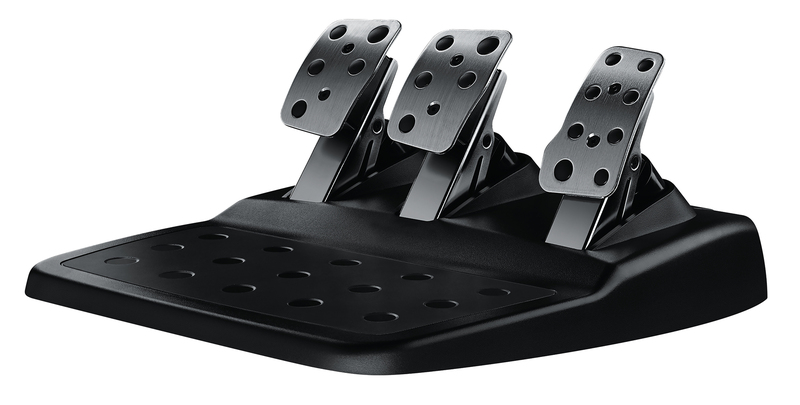 Responsive Pedal Unit: The Logitech G920 Driving Force comes with a separate floor pedal unit that lets you comfortably brake, accelerate and change gears, just as you would in an actual car, and also allows you to maintain a more realistic body position for driving. The nonlinear brake pedal simulates the performance of a pressure-sensitive brake system for a responsive, accurate braking feel. Additionally, the G920 includes a dedicated clutch, so gamers who want to test their abilities can have a truly immersive racing experience. Optional Driving Force Shifter: Available as an optional add-on, the Driving Force Shifter is a six-speed manual gear stick with push-down reverse. 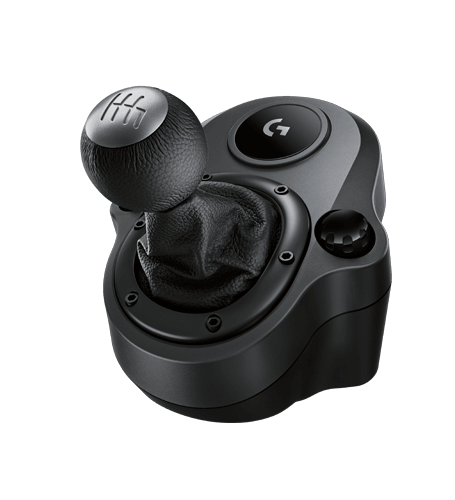 The Logitech Driving Force Shifter features quality construction, with a solid steel gear shaft and hand-stitched leather boot and knob cover. Built-in clamps and bolt points also allow the Logitech Driving Force Shifter to be mounted securely. What is Hover Cubes Arena?